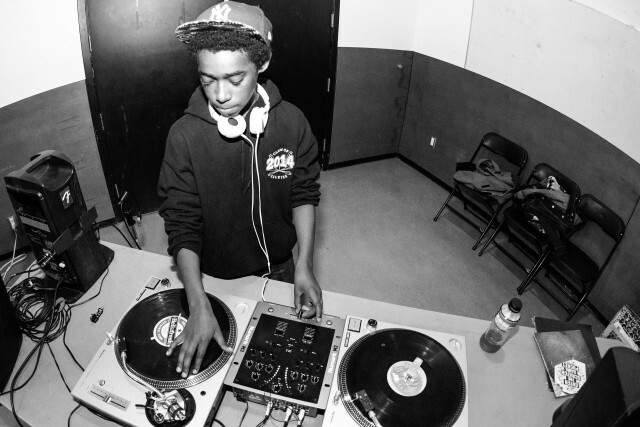 Tarik Tune aka DJ Drop Jaw shows off his amazing talent on the turntables. Photograph by Carm Kwan, Roundhouse Documentation Team. What does a Hip Hop community look like? According to the Universal Zulu Nation, a hip hop community is based on the sharing of ideas and resources, while providing service to the broader community through outreach programs. The aim of the organization is to promote peace, equality and humanitarianism through the four elements of hip hop: aerosol art (graffiti), MCing, turntablism, and bboying. At a public forum at the Roundhouse on June 14th, Vancouver Hip Hop artists came together to discuss the formation of a local chapter of the Universal Zulu Nation. “When we think about why a Zulu nation chapter is needed, the first thing that comes to mind is to create a sense of unity in our community. We hope to bring people together with art, music, dance, and passions for empowering our youth, and building bridges between the many associations. We also feel the need to provide more free, all ages events that promote peace, love, unity and having fun… the principle foundations of Hip-Hop culture, and the international Zulu nation,” says Kia Kadiri and Mattias Boon, facilitators for the Hip Hop Youth Drop-In and active Vancouver hip hop artists. Members of the Seattle Universal Zulu Nation talked about how hip hop has inspired them to give back to their community. Photograph by Carm Kwan, Roundhouse Documentation Team. This is what a hip hop community looks like. Photograph by Carm Kwan, Roundhouse Documentation Team. The origins of the Universal Zulu Nation stem back into the 1970s in the Bronx, New York. The organization was begun by Afrika Bambaataa, then just a student, who strove to bring peace amongst a number of local gangs, while still promoting the voice of hip hop that was speaking against the gentrification of the area and the displacement of the area’s poorer residents. While similar situations exist in Vancouver’s current climate, there is no unifying force in Vancouver’s Hip Hop community despite the popularity among its residents of all ages. King Khazm talks about the history of the Universal Zulu Nation and how it has brought positive changes to his community in Seattle. Photograph by Carm Kwan, Roundhouse Documentation Team. The community focus of the organization offers people at risk a safe place to connect with the hip hop culture. While gangs might appeal to youth at risk for their family structure when they don’t have stability in their homes, the Universal Zulu Nation community welcomes families and a chance to make a valuable contribution to the community at large. “Each one, reach one,” said King Khazm at the meeting, and I know that’s what the Vancouver Hip Hop community is striving to do. How has hip hop been a positive force in your life? What would a Universal Zulu Nation Vancouver chapter mean to you? Check out more photographs from the meeting here. Are you interested in contributing to the formation of a Vancouver chapter of the Universal Zulu Nation? Please contact Kia Kadiri, Interim Chapter Delegate at kiakadiri@hotmail.com. Or, e-mail streetrichvancity@gmail.com for more information.